A weather satellite that Lockheed Martin built for the National Oceanic and Atmospheric Administration took off Thursday aboard a United Launch Alliance-built Atlas V rocket from Cape Canaveral Air Force Station in Florida. The Geostationary Operational Environmental Satellite-S system will be called GOES-17 once it reaches the geostationary orbit within two weeks and will undergo a checkout and validation phase for its six instruments before the system becomes operational, NASA said Friday. Lockheed said Thursday GOES-S will join the GOES-R satellite that is already in orbit to collect Earth images and aid short-term weather forecasts, maritime forecasts, storm warnings and space weather predictions across the Western Hemisphere. 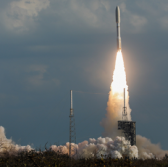 GOES-R lifted off aboard the Lockheed-Boeing joint venture’s rocket in November 2016 as the first of NOAA’s four GOES-R Series satellites. GOES-S took off with six payloads that include the Lockheed-developed Geostationary Lightning Mapper and the Solar Ultraviolet Imager instruments. NOAA funds, oversees and intends to run the satellites, while NASA is responsible for the procurement and development of the weather satellites and related instruments for NOAA.